Mes activités consistent à proposer des techniques et méthodes de mesure adaptées à la caractérisation des feux et à concevoir des dispositfs expérimentaux aux échelles du laboratoire et du terrain. F. Morandini, P.A. Santoni and J.H. Balbi. 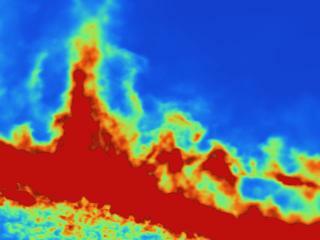 Validation study of a two-dimensional model of fire spread across a fuel bed. Combustion Science and Technology, 2000, 157: 141-165. F. Morandini, P.A. Santoni and J.H. Balbi. The contribution of radiant heat transfer to laboratory-scale fire spread under the influences of wind and slope Fire Safety Journal, 2001, 36: 519-543. F. Morandini, P.A. Santoni and J.H. Balbi. 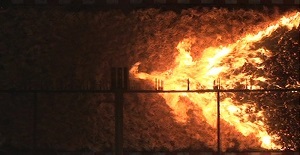 Fire Front Width Effects on Fire Spread across a sloping Fuel Bed at Laboratory Scale. Combustion Science and Technology, 2001, 166: 67-90. F. Morandini, P.A. Santoni, J.H. Balbi, J. Ventura, J. Mendes-Lopes. 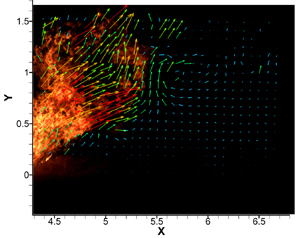 A two-dimensional model of fire spread across a fuel bed including wind combined with slope conditions. International Journal of Wildland fire, 2002, 11(1): 53-63. F. Morandini, A. Simeoni, P.A. Santoni, J.H. Balbi. A model for the spread of fire across a fuel bed incorporating the effects of wind and slope, Combustion Science and Technology, 2005, 177: 1381-1418. P.A. Santoni, A. Simeoni, J.L. Rossi, F. Bosseur, F. Morandini, X. Silvani, J.H. 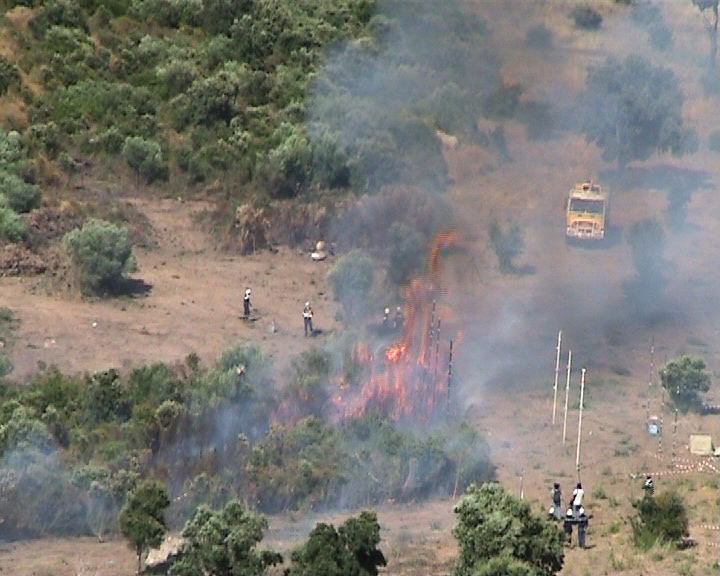 Balbi, D. Cancelieri, L. Rossi, Instrumentation of wildland fire: characterisation of a fire spreading through a Mediterranean shrub, Fire Safety Journal, 2006, 41(3): 171-184. F. Morandini, X. Silvani, L. Rossi, P.A. Santoni, A. Simeoni, J.H. Balbi, J.L. Rossi, T. Marcelli. 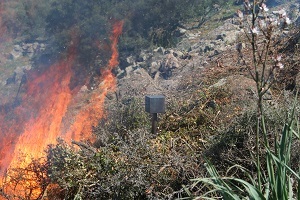 Fire spread experiment across Mediterranean shrub: influence of wind on flame front properties, Fire Safety Journal, 2006, 41(3): 229-235. X. Silvani, F. Morandini. 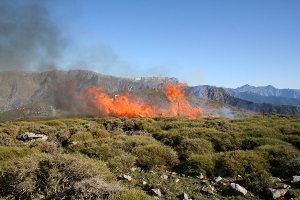 Fire spread experiments in the field: Temperature and heat fluxes measurements, Fire Safety Journal, 2009, 44(2): 279-285. M. Cannac, V. Pasqualini, T. Barboni, F. Morandini, L. Ferrat. 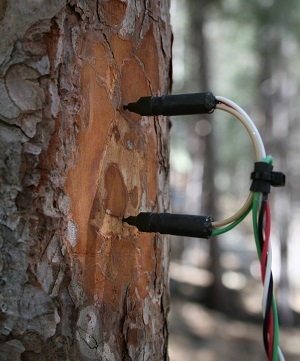 Phenolic compounds of Pinus laricio needles: A bio indicator of the effects of prescribed burning in function of season, Science of the Total Environment, 2009, 407: 4542-4548. M. Cannac, T. Barboni, L. Ferrat, A. Bighelli, V. Castola, J. Costa, D. Trecul, F. Morandini, V. Pasqualini. 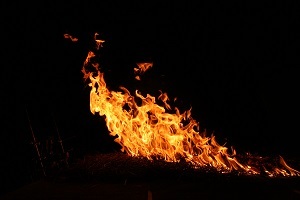 Oleoresin flow and chemical composition of corsican pine in response to prescribed burnings, Forest Ecology and Management, 2009, 257: 1247-1254. X. Silvani, F. Morandini, J.-F. Muzy. Wildfire spread experiments: fluctuations in thermal measurements, International Communication in Heat and Mass Transfer, 2009, 36(9): 887-892. T. Antoine-Santoni, X. Silvani, F. Morandini, J.F. Santucci, E. De Gentili. 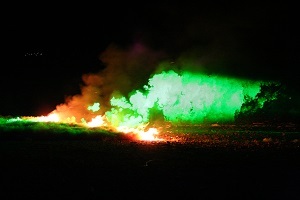 Performance of a protected Wireless Sensor Network in a fire. 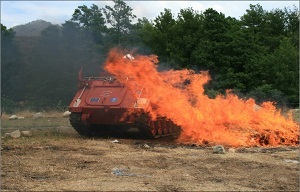 Analysis of fire spreading and data Sensors, 2009, 9(8), 5878-5893. J.H. Balbi, F. Morandini, X. Silvani, J.B. Filippi and F. Rinieri. A Physical Model for Wildland Fire Combustion and Flame, 2009, 156(12): 2217-2230. J.B. Filippi, F. Morandini, J.H. Balbi, D. Hill. Discrete event front tracking simulator of a physical fire spread model, Simulation, 2010, 86(10): 629-646. M. Cannac, L. Ferrat, T. Barboni, N. Chiaramonti, F. Morandini, V. Pasqualini. Identification of flavonoids in Pinus Laricio needles and changes occurring after prescribed burning Chemoecology, Springer Verlag, 2010, 21 (1), pp.9-17. F. Morandini, X. Silvani. 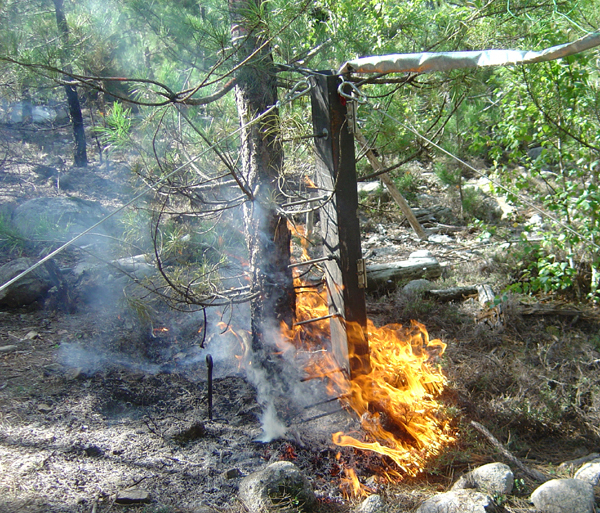 Experimental investigation of the physical mechanisms governing the spread of wildfires, International Journal of Wildland Fire, 2010, 19: 570–582. A. Simeoni, P. Salinesi and F. Morandini. Physical modelling of forest fire spreading through heterogeneous fuel beds, International Journal of Wildland Fire, 2010, 20(5): 625-632. M. Cannac, L. Ferrat, F. Morandini, T. Barboni, V. Pasqualini. 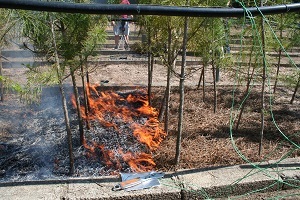 Identification of flavonoids in Pinus laricio needles and changes occurring after prescribed burning, Chemoecology, 2011, 21: 9–17. P.A. Santoni, F. Morandini and T. Barboni. Steady and Unsteady Fireline Intensity of Spreading Fires at Laboratory Scale, Open Thermodynamics Journal, 2010, 4: 212-219. T. Barboni, F. Morandini, L. Rossi, T. Molinier and PA Santoni. Measure of the fireline intensity obtained by calorimetry and the relationship with the flame length, Combustion Science and Technology, 2012, 184(2): 186-204. P.A. Santoni, F. Morandini, T. Barboni. Determination of fireline intensity by oxygen consumption calorimetry. Journal of Thermal Analysis and Calorimetry, 2011, 104(3): 1005-1015. F. Morandini, X. Silvani and A. Susset. 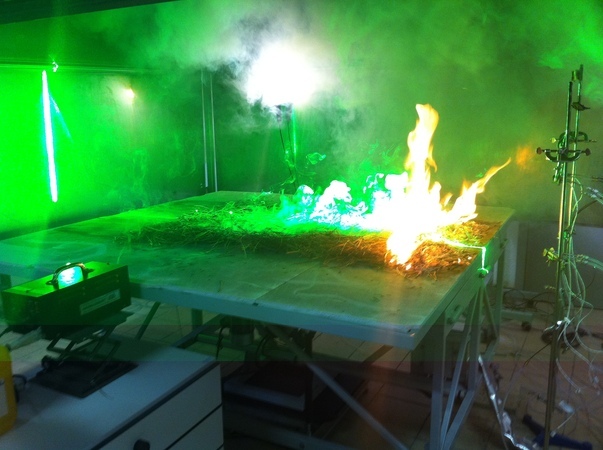 Feasibility of Particle Image Velocimetry in Vegetative Fire Spread Experiments, Experiments in Fluids, 2012, 53(1): 237-244. 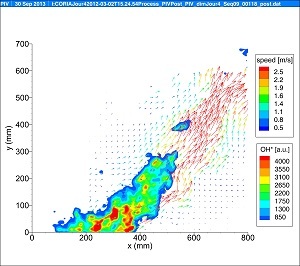 X. Silvani, F. Morandini and J-L Dupuy, Effects of slope on fire spread observed through video images and multiple-point thermal measurements, Experimental Thermal and Fluid Science, 2012, 41: 99-111. V. Tihay, F. Morandini, P.A. 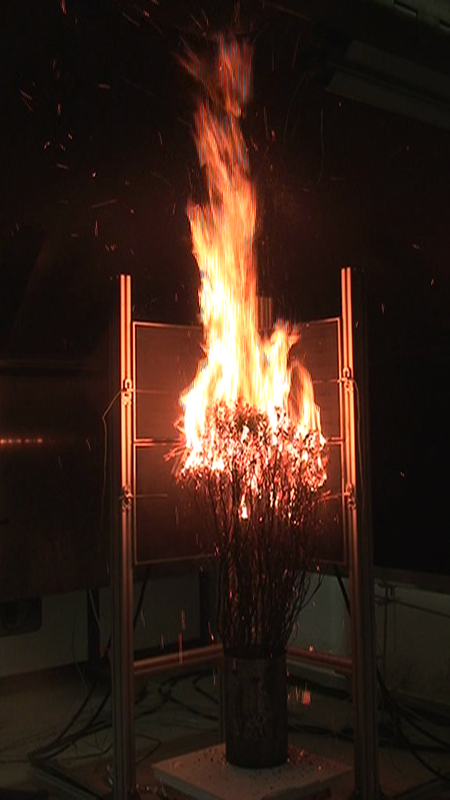 Santoni, Y. Perez-Ramirez and T. Barboni, Study of the influence of fuel load and slope on a fire spreading across a bed of pine needles by using oxygen consumption calorimetry, Journal of Physics: Conference Series 2012, 395(012075): 1-9. F. Morandini, Y. Perez-Ramirez, V. Tihay, P.A. Santoni, T. Barboni, Radiant, convective and heat release characterization of vegetation fire, International Journal of Thermal Sciences, 2013, 70: 83-91. V. Tihay, F. Morandini, P.A. 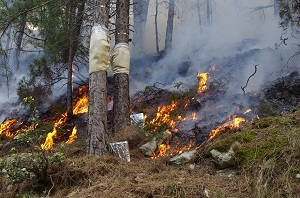 Santoni, Y. Perez-Ramirez and T. Barboni, Combustion of forest litters under slope conditions: Burning rate, heat release rate, convective and radiant fractions for different loads Combustion and Flame, 2014, 161: 3237-3248. 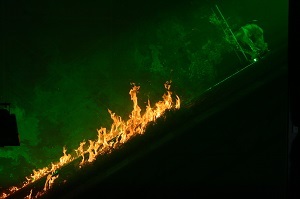 F. Morandini, X. Silvani, D. Honoré, G. Boutin, A. Susset and R. Vernet, Slope effects on the fluid dynamics of a fire spreading across a fuel bed: PIV measurements and OH* chemiluminescence imaging, Experiments in Fluids, 2014, 55:1788. X. Silvani, F. Morandini, E. Innocenti and S. Perez, Evaluation of a wireless sensor network with low cost and low energy consumption for fire detection and monitoring, Fire Technology, 2014, 1-23. 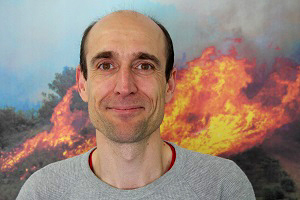 V. Leroy-Cancellieri, P. Augustin, J.B. Filippi, C. Mari, M. Fourmentin, F. Bosseur, F. Morandini and H. Delbarre, Evaluation of wildland fire smoke plume dynamics and aerosol load using UV scanning lidar and fire-atmosphere modelling during the Mediterranean Letia 2010 experiment, Natural Hazards and Earth System Sciences, 2014, 14: 509-523. D. Weise, E. Koo, X. Zhou, S. Mahalingam, F. Morandini, JH. 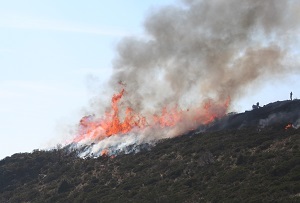 Balbi, Fire spread in chaparral – a comparison of laboratory data and model predictions in burning live fuels International Journal of Wildland Fire, 2016, 25: 980-994. X. Silvani, F. Morandini, J.L. Dupuy, A. Susset, R. Vernet, Olivier Lambert, Measuring velocity field and heat transfer during natural fire spread over large inclinable bench Experimental Thermal and Fluid Science, 2018, 92: 184–201. F. Morandini, X. Silvani, J-L Dupuy, A. Susset, Fire spread across a sloping fuel bed: flame dynamics and heat transfers, Combustion and Flame, 2018.